W P Weston Homepage - Canadian Artist and Painter from British Columbia. William Percy Weston is one of Canada&apos;s most exceptional artists. He was one of the first to capture the ephemeral, majestic beauty of British Columbia. His work is of the vintage and quality as his contemporaries, the Group of Seven and Emily Carr, although he never rose to the same level of fame or commercial success. His list of accomplishments is impressive. Weston&apos;s paintings are held in major collections, such as the National Gallery of Canada in Ottawa, the Vancouver Art Gallery, Hart House, the University of Toronto, and the University of British Columbia. 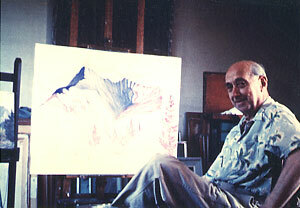 His work has been exhibited in London and at the World&apos;s Fair in New York. He was one of the first BC artists to have a solo exhibition at the Vancouver Art Gallery, after Emily Carr and Thomas Fripp. Weston was the first painter in the west to be elected an Associate of the Royal Canadian Academy. He became an original member of the Canadian Group of Painters, formerly the Group of Seven. He was made a life-member of the British Columbia Society of Fine Artists, after he completed a seven-year term as president. He taught other successful Canadian artists, such as Gordon Smith. And yet, today W.P. Weston is not as well known as his contemporaries Emily Carr or Lawren Harris. Weston was art master at the Provincial Normal School, formerly the King Edward School at 12th and Oak, in Vancouver, from 1914 until his retirement, in 1946. He also taught summer school in Victoria for many years. W.P. Weston sold, and in some instances, gave away art during his life. He earned his main source of income from his teaching career, so he did not have to depend on the commercial success of his art to survive, as other artists did. In the 1930s and 40s his imaginative interpretations of British Columbia were both celebrated and controversial. Weston was considered avant-garde at that time, but by the 1960s, tastes changed and new styles of visual art emerged. The abstractionists became the next major movement, but Weston resisted the turbulent changes of the art world. He believed art should be somewhat representational and continued to paint landscapes in his own, distinct style. The most remarkable aspect of W.P. Weston is the passionate drive to know every inch of the mountainous, coastal landscape at the core of his paintings. The real measure of Weston&apos;s success is how powerfully he interpreted British Columbia through his art, with sound technique, imagination and idealism.